It is over half a century since the last good book on Giovanni Belzoni was published (Mayes, 1959). Here, written by a noted archaeologist and former Director of Colonial Williamsburg archaeological research programme, is a splendid and up-to-date story of the, literally, giant (2m. tall) and pioneer Egyptologist. Many writers of recent years have had a tendency to denigrate Belzoni and his work, but Howard Carter wrote that his work in the Valley of the Kings was the first large scale excavations in the Valley, and “we must give Belzoni full credit for the manner in which they were carried out … on the whole the work was extraordinarily good”. Belzoni’s detractors fail to recognise the ethos of the period in which he worked. 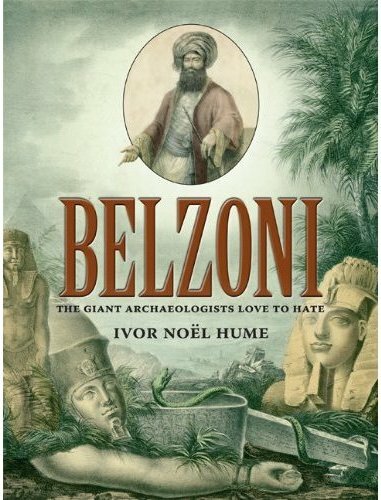 Noël Hume’s new biography puts Belzoni firmly in his place as a pioneer who really thought about his discoveries – he was no rabid collector like his rival Drovetti, without thought for interpretation or context. From humble beginnings in Padua via the fairgrounds of Europe, fate cast him into Egypt where, against all initial adversities he found a calling and followed it. Some of the finest sculptures in the British Museum, notably the colossal 7½ ton head of Rameses II, the sarcophagus of Sety I in Sir John Soane’s Museum, and the sarcophagus lid of Rameses III in Cambridge, are all due to his endeavours. Added to that, he retrieved the Philae obelisk for William John Bankes (now at Kingston Lacy) whose inscription was to be vital in Champollion’s decipherment of hieroglyphs in 1822. He was the first European to enter the Pyramid of Khafra at Giza, and the first to find the entrance to the Great Temple at Abu Simbel. Noël Hume brings to life both Belzoni and the world in which he carried out his explorations, and adds much new insight into that life, and that of his long-suffering but devoted wife, Sarah. It is ‘sod’s law’ that on excavations the best finds turn up on the last day, and Noël Hume has been similarly bedevilled. Belzoni died at Gato in Benin in 1823, and Sarah in Jersey in January 1870. Mayes did not know where she was buried and both Noël Hume and the reviewer (unbeknownst to each other) have for years been trying to locate her grave via Jersey local newspapers, radio and personal contact, to no avail. 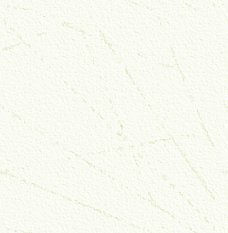 As, literally, the book was finished and published word came that her grave and inscribed tombstone had been found [see my comments below – Ed.]. Now the chase is on for details of how and who provided for her burial. Egyptological research, even after a couple of centuries, continues to have surprises and goals to pursue. University of Virginia Press, 2011. Peter is the author of several books, including the indispensable Chronicle of the Pharaohs. I wholeheartedly agree with Peter Clayton that this is an excellent book. The author combines academic rigour with a writing style, full of amusing anecdotes and domestic details, that makes for easy reading by the layman. As Peter mentions, the grave of Sarah Belzoni in Jersey has now been located, as was reported in the ‘Readers’ Letters’ pages of both AE68 and, with a clearer picture, AE69. Hume also acknowledges the article on Belzoni’s sarcophagi written by Dylan Bickerstaffe and published in AE36 (June/July 2006). The elite Middle Kingdom rock tombs burrowed into the cliffs at Beni Hasan are renowned for their richly painted wall decoration. This group of thirtynine large rock-hewn tombs mostly belongs to the powerful nomarchs (governors) of the Oryx Nome, and dates from the end of Dynasty XI and early Dynasty XII. The wealth of artistic motifs represented on the walls of a number of the biggest and best-preserved tomb-chapels is quite extraordinary. The decorative programs of these are composed, in particular, of an extensive assortment of fascinating and unusual vignettes drawn from the genre frequently referred to as the ‘scenes of daily life’. They also exhibit an impressive range of accurately observed images capturing varied aspects of the ancient Egyptian animal world. These famous monuments have attracted the attention of scholars and travellers since the earliest days of Egyptology. The fundamental publication of them still remains the four volumes produced by the Egypt Exploration Fund (now Society) between 1893 and 1900. The wall-paintings at Beni Hasan have unfortunately suffered much damage with the passage of time. In recent decades, however, the Supreme Council of Antiquities has undertaken a conservation program of cleaning the walls of the better-known tombchapels, and their overall appearance has markedly improved since I first visited the site in the early 1970s. Students of Egyptian art will already be familiar with the selection of superb photographic colour plates of tomb scenes and various details from the site, in Abdel Ghaffar Shedid’s commendable Die Felsgräber von Beni Hassan in Mittelägypten (Philipp von Zabern: Mainz, 1994). The present monograph of Kanawati and Woods is a valuable and accessible introduction to this provincial necropolis. 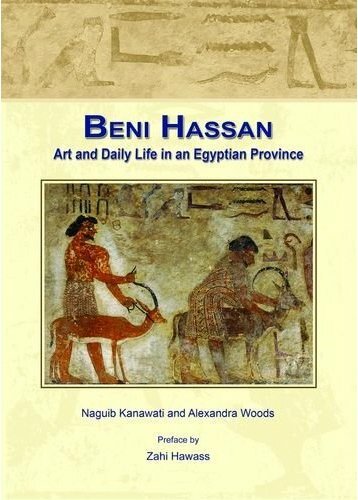 The book begins with a general overview of the history and importance of Beni Hasan. It also highlights the significant architectural features and varied artistic themes to be found in these rock-cut tombs. The following section of the work conventionally describes the decorative program of four selected tomb-chapels: Amenemhat (No. 2), Khnumhotep II (No. 3), Baqet III (No. 15), and Khety (No. 17). The final chapter offers a fuller exposition of the individual elements of the tombs’ decorative scheme, and then briefly compares these mural compositions with those in other Egyptian tombs of the age. The real highlight and strength of Kanawati and Woods’ new study, in this reviewer’s eyes, is the profusion of good-size colour illustrations it contains. Altogether, there are 245 colour photographs taken at Beni Hasan, which are the work of Ms. Effy Alexakis. Some representations long known from simple line-drawings or facsimiles are now seen afresh in colour photographs for the first time. The appearance of these pictures, it must be acknowledged, falls well beneath the standard achieved in Shedid’s earlier publication. A number of them are too dark and muddy. In this regard, the authors were not well served by their publisher. However, since colour photographs from the tomb-chapels at Beni Hasan are so rare in the literature, this book is especially welcomed. Nile travellers to this rather remote site will also find it useful as well, but its large format isn’t particularly conducive to having it in one’s hands when visiting the tombs. Patrick is the author of several books including Wit and Humour in Ancient Egypt and The Birds of Ancient Egypt – the latter the subject of our recent ‘Classic Review’ (AE69). At this time of change in Egypt, it is perhaps instructive to look at an earlier period of unrest, when in January 1952 Cairo was swept by rioting mobs intent on burning all buildings and property associated with the British. 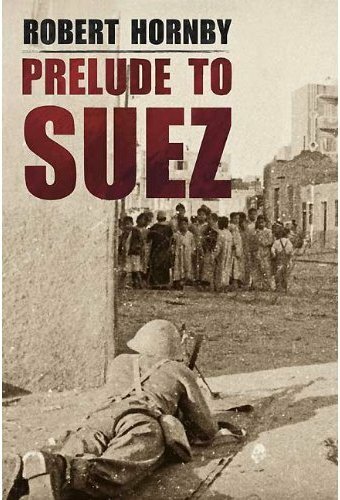 Three months before, the Anglo-Egyptian Treaty of 1936 had been abrogated, meaning that all British army personnel had to withdraw to the Canal Zone base at Suez. The author of this book, Colonel Robert Hornby, was already employed as the Press spokesman for the army, and decided to remain in Cairo risking imprisonment and worse. It is clear from Hornby’s account that it was the Egyptian military who orchestrated the uprising and indeed continued to control the country thereafter. They used propaganda extensively, accusing the British of a series of atrocities without foundation in fact. It was Hornby’s role to counter these accounts, by giving the true facts to the international press. But this was before the days of mobile phones and satellite communications, and the only way of transmitting unbiased information from Cairo to the outside world was via an illegal phone line set up by Hornby, connected to the British base. This he allowed the foreign correspondents in Cairo to use, thus circumventing the censorship imposed on the official channels of communication. Before long, Hornby was forced to flee with his family to Cyprus, but soon returned, this time with a diplomatic passport. During his subsequent stay in the country he witnessed the end of the monarchy with the abdication and exile of King Farouk. He even became a personal friend of one of the key players in the insurgency, Anwar Sadat, who was later to become President of the country. For a different perspective on Egypt in the modern era, this book is a timely exploration of the political events that led up to the January 25th Revolution, written by a leading American expert on Arab and Turkish politics. 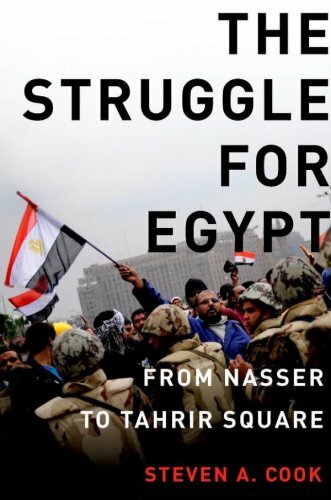 Extensively researched, with a 39-page bibliography, the work should appeal to academics, foreign policy specialists and anyone with an interest in Egypt and current affairs. Covering the rise of Nasser, relationships with Israel and the US, the assassination of Anwar Sadat, the emergence of the Muslim Brotherhood and the recent uprising in Tahrir Square that overthrew Mubarak’s regime, Cook demonstrates that Egypt’s internal battles are far from being a recent development. Challenging the prevailing assumptions among Western leaders about the source of Egyptian instability, he suggests that the Egyptian people have been in open revolt with their leaders since the Arab nationalist uprising in 1882; rather than being a rebellion against Mubarak as leader, the 2011 revolt was fought against a regime inherited by him but which began in 1952 with Nasser and the Free Officers. According to Cook, Mubarak’s attempts to use economic development to promote loyalty to the state, whilst relying on coercion to maintain order, created a corrupt police state, and claims of vote-rigging and intimidation during the 2010 People’s Assembly elections, together with Mubarak’s deteriorating health, led to the demands for change. Cook concludes that Egypt cannot hope to rebuild her society and political system without solving the underlying issues such as the roles of democracy, Islam, nationalism and liberalism, and ends by pointing out that, with both demands for democratic change and the ominous signs of authoritarianism, the struggle for Egypt continues. Dylan Bickerstaffe continues our series rediscovering classic Egyptology texts, with a must-have book for all Egyptologists. 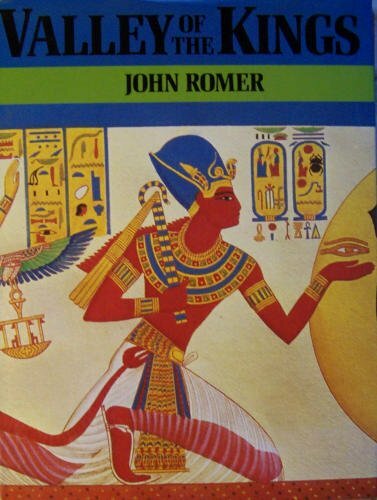 It was reading John Romer that led to my first visit to Egypt, in 1986. By then I was already familiar with his direct and unfussy presence on TV – first in a programme about his clearance of KV4, and then in his series Ancient Lives on the workmen of Deir el-Medina – so the find of Romer’s Egypt at £3 in a car boot sale proved irresistible. I remember being surprised, when I first picked up his Valley of the Kings, that a large book on such a specific subject would appear on bookshop shelves as popular history. I read it from cover to cover, and the beginnings of my fascination with the royal cache tombs and the royal mummies surely date back to that point. The basic theme of the book is the history of exploration, research, and discovery in the Kings’ Valley from when it fell out of use as a royal cemetery, right through to Carter’s discovery and clearance of Tutankhamun’s tomb. However, along the way, Romer also explains how the architecture of the tombs there developed; how the scenes of the afterlife which decorated the walls evolved; and what we have learned of the techniques employed by the various scribes, quarrymen, overseers, and artists employed in their construction. Romer is an especially illuminating guide since he spent many hours examining the interior of tombs in minute detail – thereby discovering many ancient graffiti for the first time. The reader also benefits from the insights Romer, as an artist himself, is able to bring to the skill and confidence of the painters from so long ago, who so quickly and accurately drew the elegant figures on the walls that still excite admiration and wonder today. Amusingly, he points out that our appreciation is nothing new, and at the end of the New Kingdom, Scribe Amenhotep found time to turn art critic and leave a graffito on the wall: “A thousand times beautiful is the painting below”. The book is impressively comprehensive, not aimed at those who want a quick and simple guide. However, Romer’s relaxed and conversational style means that it does not become difficult to read. No book is ever perfect, of course, and I have shown (see the article – beautifully illustrated by Bob Partridge – in AE 6.6 No. 36) that Romer was amongst those who mistakenly believed the sarcophagus lid acquired by Belzoni was that of Rameses III. He was also awry in some of his judgements regarding the Royal Cache tomb (TT/DB320), but did not have the benefit of the information that came to light during the re-clearance work conducted from 1998 to 2005; nor was he able to draw upon Victor Loret’s recently rediscovered notes and diaries for the clearance of KV35 (which included the second cache of royal mummies). It may seem odd that I should celebrate a book that I am in the process of superseding, but we all stand on the shoulders of those who preceded us. Romer’s Valley of the Kings was made possible by Elizabeth Thomas’ The Royal Necropoleis of Thebes (1966), and Nicholas Reeves’ Valley of the Kings: Decline of a Royal Necropolis (1990) and The Complete Valley of the Kings (1997) drew upon both Thomas and Romer. However, none of this really diminishes the value of the book today, and Romer’s insight into so many issues is so sure that any researchers into the history of the Kings’ Valley inevitably find themselves constantly turning back to see what Romer said on one key topic or another. Everyone should own a copy. Dylan is an Egyptologist and author, with a particular interest in the Royal Mummies and the late Roman period. He is well known to members of UK Egyptology societies at whose meetings he is a frequent presenter.